ORGANIC, NATURAL PRE & POST SHAVE OIL – Sesame Oil Nourishes Skin – Protects, Deep Cleanses, Moisturises, Revitalises, Protects, healths and Defies Aging! Defying. Soft, Smooth, Glowing Skin. Great smell lasting all day!! LOOK & FEEL GREAT – Exceptional all-in-one oil provides an amazing Barrier, Protects your skin as you shave and nourishes it afterwards. Detoxify and regenerate skin, prevent razor burn and inflammations. A repair kit to give good health to your skin. ALL NATURAL, ORGANIC INGREDIENTS – Only the purest organic Odourless Sesame Oil and a few drops of Essential oils. Gives skin a blast of essential vitamins and other nutrients to promote healthy skin and keep you looking your best! 100% MONEY BACK GUARANTEE – Try a bottle risk-free. If you don’t absolutely love it, we’ll give you 100% of your money back – guaranteed! We want to make sure that you’re completely thrilled with our product, so we stand behind it 100%! Prepares, protects and replenishes your skin during and after your shave. Having healthy, smooth skin will do wonders for helping you make a great impression. Don’t trust your skin’s health to just any or numerous products! 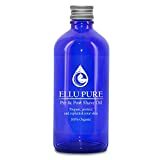 Ellu Pure Pre & Post Shave Oil keeps your skin care simple and pure. Our Oil creates a barrier for shaving, moisturises as it nourishes, protects as it cleanses, making it an ideal choice for your everyday shaving and skin care regime. Sesame Oil is Naturally packed full of vitamins E, K and B6, magnesium, copper, calcium, iron, zinc and essential fatty acids. It absorbs in very easily. It’s naturally antibacterial and calms inflammation. GREAT FOR MEN & WOMEN! Experience a great shave…smooth, protected, clean looking skin. Check out Ellu Pure’s other gorgeous oils for skin care and massage. GET YOUR ELLU PURE SUPPLY NOW! Why worry about shaving and the health and condition of your skin, when you can have the smoothest, cleanest shave, as well as the healthiest, clearest, most great-smelling skin? Order your supply now, while supplies are available! MADE WITH CARE IN THE UK – All our products are made in an approved facility right here in the UK, so you know Ellu Pure is a Brand you can trust!